There have been a lot of rumors and discussion about the possibility of the Georgia Bulldogs wearing new alternate black jerseys for the Kentucky game this Saturday. Saturday’s game vs. the Wildcats is Senior Night and the last home game of the 2013 season. It will also be the final game between the hedges for quarterback Aaron Murray and the other UGA seniors. Speaking to Logan Booker of Bulldawg Illustrated last week after the UK game was announced for a 7pm kick, Murray said he wants the team to wear black jerseys. 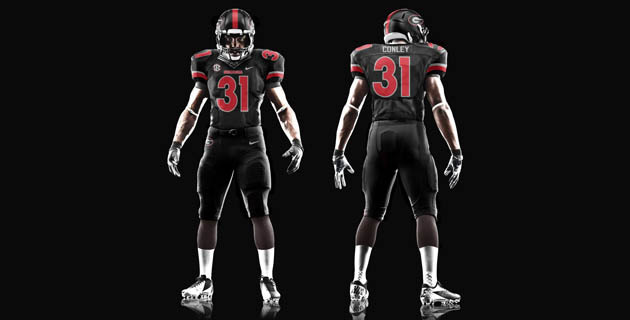 A picture surfaced online recently depicting the possible new black uniforms with the new Bulldog Bold numbers and lettering featured on Georgia’s 2013 home and away uniforms (see above). The photo was reportedly posted to Twitter by one of the UGA graduate assistants. The all black uniform is likely just a concept, but would look better with the aforementioned new gloves and cleats. If the Bulldogs were to wear the black jerseys, it’s likely they would be combined with the traditional red helmets and silver pants. Last night on his weekly call in show, head coach Mark Richt shot down the possibility of wearing black jerseys this weekend. First of all, it’s hard to believe that we don’t already have the new black jerseys on hand for future use. And it’s hard to believe that Nike, with all of their resources, couldn’t have black UGA jerseys delivered to Athens by Friday. 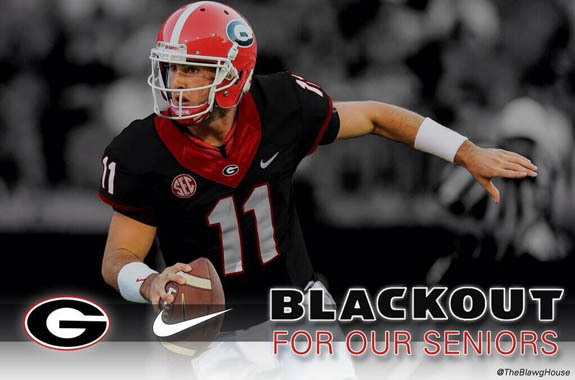 Richt went on to say that if the fans want a blackout to honor Aaron Murray and the seniors, he would be all for it. Georgia hasn’t worn an alternate uniform or helmet since the 2011 Chick-fil-A Kickoff Game against Boise State. In that game, the Dawgs wore Nike Pro Combat uniforms that drew mixed reviews from Bulldog Nation. What would Aaron Murray look like in the new style black jerseys? Here is a concept image courtesy of @TheBlawgHouse. Georgia first wore black jerseys at home in a 45-20 thumping of Auburn. It was the first “blackout” game under Richt. Richt called for a blackout again for the Sugar Bowl against Hawaii on Jan. 1, 2008. With Alabama in town, the Bulldogs again called for a blackout and wore their black jerseys. The Crimson Tide went up 31-0 on the Dawgs at the half and eventually won 41-30. Against Florida in Jacksonville, the Dawgs wore a uniform with black helmets (red facemask/white stripe/traditional “G” logo), white jerseys with black numbers, and black pants. The Gators rolled over the Bulldogs 41-17. UGA wore Nike Pro Combat Uniforms vs. Boise State in the Chick-fil-A Kickoff Game. Boise State won 35-21.